Got up this morning to go for the tiniest of runs -- over to the sea front, along the promenade to St. Trillo's Chapel, and then back. It was glorious weather -- hot but breezy enough to stay cool. All in all, it was just 3.1 miles, but it was the longest I had run since the Kirkland Half. So, again, I completely missed my mileage goal in May -- despite having run two half marathons! Ha. But this was a gorgeous little run to round out the month. So when we ran the Disneyland Half last year, we were sad that we didn't get to run up Main Street USA. So this year we contemplated running the 5K that happens the day before (a mini-Goofy? ), because it's a great course. But then the fee for the 5K was $50, which is absurd. So I let it go. THEN we got an email about the race -- and the theme is "Fabulous 5K", and the "medal" (which is made of rubber) features the "Fab Five" -- Mickey, Minnie, Donald, Goofy, Pluto. So I was tempted again -- even though our flights get in around 7, and getting to the expo on Friday night to pick up the 5K packets would have been challenging. Luckily for us, they also posted the map for the half marathon ... and they've changed the course slightly. We *do* still get to run through Angel Stadium (yay! jumbotron! ), but we also get to run up Main Street -- as it should be. It even looks like we'll run in a different "backstage" area that we've never seen. Very cool. Sitting at the airport waiting for our flight... which means I suddenly have a completely free 20 minutes after a hectic couple of weeks. So let's see -- I did go to Boot Camp days 11 and 12, which were pretty quiet. Just me and Lori on the Wednesday, and we did a lot of leg work. Then on "fun Friday" Ben set up 12 stations and we had to roll the dice to know what station to report to. Knowing that 7 is the most-rolled number, he put lunges at that station. So I loved Boot Camp -- loved the act of getting up, working out for an hour, and then arriving at my desk all giddy and "endorphined". I don't think I will pick it back up, however -- I don't know if I am working hard enough? Sure, I'd feel sore, but never really sore or tired. Not that I believe in the "no pain, no gain" stuff, but I think I need more. That said, I essentially stopped running in May. 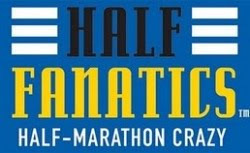 Other than the two half marathons, I only ran one small distance. So perhaps in conjunction with running I would feel more "exercised"? We're off to Blighty for the first time in years -- for Beck's wedding. Looking forward to seeing everyone again, and the change of scenery. I brought my running shoes, but Wil wasn't going to... until this morning in a last-minute change of plan he decided to wear them on the plane. 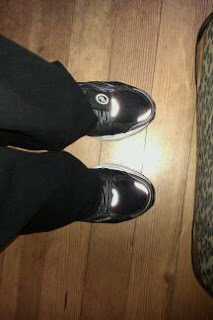 The sad shoes post earlier today shows my fashion shame... yes, I'm wearing my running shoes with my street clothes. At least they are black. Glorious weather for our third Fun Friday. I was a bit dubious when I noticed the golf clubs. I have a completely irrational dislike of golf -- or at least golf culture. No, I have never played golf. But the stereotypes of the corporate slimeballs and drunken fratboys kinda turns me off. I have friends who golf, none of whom fit the stereotype, but for some reason I still don't like the idea of golfing. So when we ran out and set up 9 "holes" around the park, with different exercises, I was feeling a little pouty. 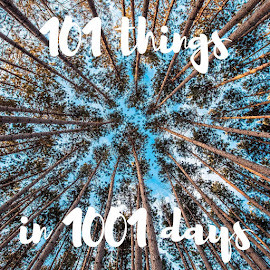 Especially since I have never actually swung a golf club outside of a few childhood rounds of putt-putt and a single bucket of balls at a driving range. I suppose it didn't matter that Ben didn't have any lefty clubs -- it wasn't as if I was going to be very productive anyway. But I took a club and began hacking away at the ball, moving it a few feet at a time. Which was okay, because I wanted to do more reps at the holes. At one point Ben ran over to give me some golf tips. I told him I didn't know how to swing a club, so it didn't really matter -- but that just made him want to show me how it's done. Let's just say I improved exponentially, but I still think my longest shot was about 50 feet. So once I got over my "ew, golf" issues, it was okay, though I missed chatting with the ladies a little. Next week is my last week -- I need to start looking for whatever will come next! Woke up this morning to a steady drizzle... and to the realization that I hadn't set my alarm for 5:00. Oops. But I had set it for 5:30 (my wake-up time for Sunday morning), and I had already packed everything for the morning and even put out the trash and recycling, so I was still on the road by 5:45. Unfortunately, the wet weather slowed down traffic and I didn't arrive at the park till 6:05. Luckily, they (Ben and Tressa) were still there. See, on wet days they hold Boot Camp "in a space undercover" -- which turns out to be the covered walkway in a nearly-empty shopping complex, the one where that great Thai restaurant Charley introduced us to used to be. So we drove over there and Ben got out the stretch bands -- brand new ones -- and some cones, and started putting us through our paces. It's much nicer to work out in the park, but as the rain got harder and harder, I was really happy to be undercover. Here's hoping for nicer weather on Wednesday. Not sure if it is Lindsay's fault or my fauit... or some kind of co-dependent thing. 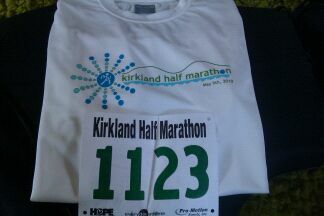 But Friday afternoon on the way home I signed us up for the Kirkland Half Marathon, and we ran it today. It was a glorious day -- perfect half marathon weather, with a cool but bright and sunny sky and it didn't get too warm until the very end. (Hence perfect HALF marathon weather...). Picked Lindsay up and carpooled to Kirkland, colonizing an empty parking lot when we arrived. Lots of milling about pre-race, both of us a bit surprised by the numbers of people who were there. They let the walkers go at 7:05, and sent us after them at 7:35. We dropped ourselves in the 10-minute "corral" and both commented on how surreal it was that we were there. With little fanfare an airhorn sounded and we were off. The map had shown two big hills before mile 4. The first one was within the first mile, and wasn't too bad. I started to think that I had worried too much about hills... until mile 3, when we saw The Hill. We started running up it, but then decided that there's really no shame in walking up a steep hill -- especially when the apartment complex half way up calls itself "The Ascent". But we hit the top, rounded a corner, and hit our first water stop. 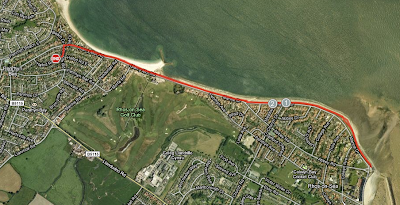 Then we ran for miles and miles along a road... at least a few of which were a long, slow, uphill. So I guess, when the man at the shop said "I hope you like hills! ", he meant it. We loped along, mocking the other runners as needed, getting cheered on by a lovely aging lesbian couple (yes, in a Subaru...), thanking the cops and the volunteers, all the way down to Bridle Trails Park -- which was right around the half-way point. At the water stop after mile 7 we ate a gel each. Me: chocolate Hammer Gel. Lindsay: tri-berry Gu. Then we started going downhill fast. Thump thump thump past the garbage dump -- and the nice young man with his electric guitar and tiny amp, playing "Chariots of Fire". Nice. We crossed 405 on one of those pedestrian bridges (oh, so THAT's who uses those!) and then thumped farther downhill. A few more twists and turns and we were suddenly on the waterfront near Kirkland -- and the 10-mile point. Hooray! 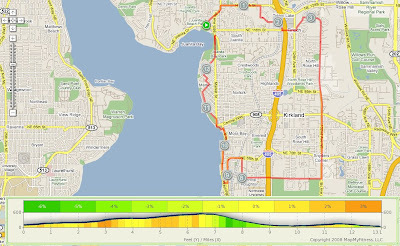 We skipped most of downtown Kirkland -- running through the waterfront park rather than on the roads -- and then we were off again. We passed two cops who said "Last hill! You're looking great!" We asked for permission to walk up the hill, which they granted. Of course, a few blocks later, we came to another hill. I guess you can't trust the cops. 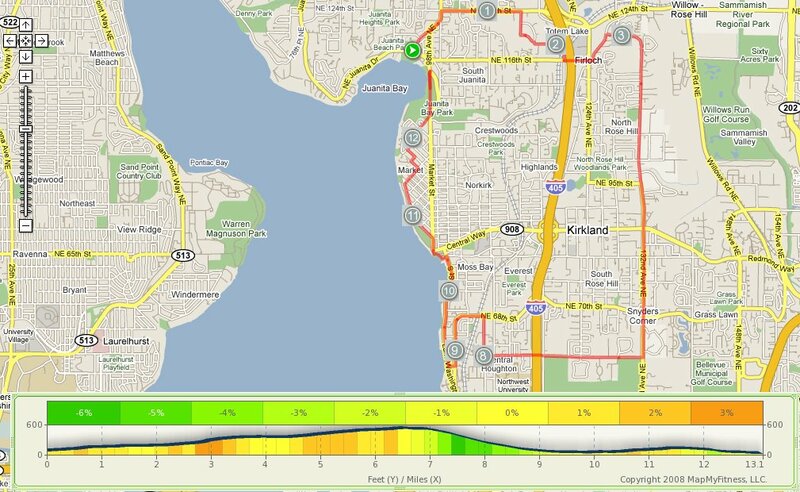 Some more winding through Kirkland 'hoods, past megamansions and the final water stop. Suddenly we veered off into a park I didn't know existed, and then we hit the 12 mile marker -- yay! We ran along an old road that's now a pedestrian boardwalk through a nature preserve, turned left at the Michaels, and hit the home stretch. We crossed with a clock time of about 2:33 -- but no final results yet. Oh, and we both got shout outs as we entered the chute. We turned in our chips, grabbed bottles of water, and an apple each... and then decided to bail. Both of us needed the restorative powers of a Diet Coke. Weird omission: no medals? Really? I was pretty sure Lindsay and I tied for #1 in the Most Awesome Division. A few random memories: three people wearing the Vibram Five Fingers shoes; the identically dressed duos, and of course, leather legs. Ew. So, with the result, I can now join the Half Fanatics and hold my head up high. Thanks Lindsay for being my totally awesome running buddy! Today was another "Fun Friday" at boot camp -- and it really WAS fun! Ben set up 20 different exercise stations along a long stretch of path, with a magnetic dartboard at one end. The rules were simple -- you threw a dart and took direction as to which station to visit from your "score". Then you ran to the station and did 15 reps -- or 20 if you had missed the target completely on your first throw. It was fast-moving and had plenty of variety. Ben kept moving between the 4 of us (no Tressa today, again) and kept correcting our form, etc. I was surprised how quickly the time went -- even if I got sent to the pushup station twice and the crunches station three times. I will say that it's easier to do crunches than it was even a week ago... so I guess that's something. Plus I really enjoy the running around and exercising. Funny randomness -- learned that one of the ladies also works at TMO... and then I actually passed her in Loehmann's Plaza when I went out for a walk with Lisetta and Stasi at lunch. Small world, innit? So, boot camp is officially half over, which makes me a tiny bit sad. But we'll see how I feel on Monday! Fled an absurdly boring work offsite (about which the least said, the better....) to come home and nap before going to the Tractor to see Jonathan Richman play the first of two nights. The doors were for 9, but when Wil called they also said that JR would take the stage at 9. This seemed unlikely in this city of "club shows" where the usual pattern is doors at 8, opening act at 9, and headliner at 10 or later. But when we arrived at 9:30, JR was on stage and crooning away. It was lovely to see him -- my first time seeing him live -- he seems the embodiment of the word "troubador" or "balladeer", somehow. He sings and plays with such joy that the whole room was enraptured. A few minutes after we arrived he played his wonderful, marvellous, "Dancing in a Lesbian Bar" song; leaving his drummer and the audience to clap the rhythm, and the audience to sing the choruses while Jonathan engaged in what could only be called a "dance solo". Delicious! Our beloved Rebecca ran her first ever half marathon in Eugene on Sunday as well with the fantastic time of 2:26! Way to go! We're so proud of you!!! !